What is the Sig Ep Legacy Project? It is where Life Stories are preserved! Many of us have memories, but Sharing these memories with our Brotherhood makes us special! We, as brothers, know that once these memories are Lost, they stay lost! Recently, a brother found a Paddle from the 1960’s in an antique shop. We know it is from Toledo, but what is the story? The Legacy Project has three very distinct concepts! 1.) Preserving our Local Sig Ep/Chi Beta Chi History Online. Scrap books, Red Doors, Composites, Pictures and Videos of our History. Nearly 30 Red Doors are located on Line Now…. dating back to 1979! 2.) Creating Participation from our Brotherhood, whereby All help to make this a collaborative project together. We ARE SIG EP…. Why not take the Time to Add your Touch to Sig Ep? How many of you have Pictures, videos of Song Fest, Memories, Letters, or memorabilia that we want to share? You may have a Brotherhood pin you want to pass down……. You may find something from a Conclave, or from a Formal, that you want to share! Maybe something you think another Sig Ep may want, or cherish as you grow older and want to put to use! 3.) Creating your Legacy with Toledo. 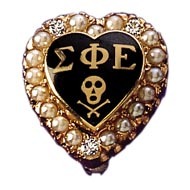 Make the Ohio Iota Chapter of Sigma Phi Epsilon a part of your Will. What is holding you back? We have the most engaged Alumni Board ever, and our Mission is to protect this brotherhood forever! To do this, we must engage our Alumni to be good stewards and Give Back. Paying it Forward has ALWAYS Benefited the chapter. SO…. PAY IT FORWARD!